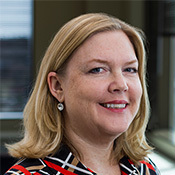 Jill Kolling leads sustainability for Cargill in the company’s operations and supply chain group. Jill’s newly formed team is responsible for accelerating Cargill’s sustainability-related efforts by providing focus, alignment, guidance and leadership support – while leveraging insights and expertise across the company. Prior to her current role, Jill held the positions of Sustainability Leader for Cargill’s $20+ billion Protein business and Senior Director of Sustainability in Corporate Affairs. Jill served as co-chair for the Midwest Row Crop Collaborative which unites industry and conservation leaders to improve soil and water quality in the U.S. states of Illinois, Iowa and Nebraska. She was also on the Board of Directors for the Global Roundtable for Sustainable Beef. Prior to joining Cargill in January 2015, Jill was an accomplished entrepreneur in the field of sustainability and management consulting. She was recognized as an Ernst & Young 2006 Entrepreneur of the Year® finalist in Minnesota and the Dakotas. Jill holds a Bachelor of Mechanical Engineering and a Master of Science in computer science, both from the University of Minnesota.